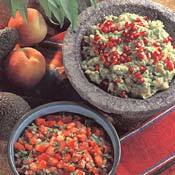 RECIPE TITLE "Uncooked Mexican Salsa Recipe"
Green, white and red like the Mexican flag, this salsa is the most popular of them all. Although the recipe is subject to some regional variations, the name of the salsa is always the same, except in the Yucatan, where the Mayan name is x-ni-pec, or dog's snout because it is made hot enough there to make your nose run. Mix all of the ingredients together just before serving; everything except the cilantro can be prepared ahead of time. To prepare the salsa as it's made in northern Mexico, coarsely chop the tomatoes and mix with a minced (finely chopped) garlic clove. Add the water mixed with a little lime or lemon juice. For Yucatan-style salsa, add lightly toasted yellow chiles and replace the water with orange juice; you can also add a dash of olive oil.